Groom’s side of the story It had been a couple of months since I had been on Tinder, the relentless barrage of mundane people & conversations began to take a toll, until one day I had the honor of matching with Nitima – and slowly I began to realize that I (almost by accident) had stumbled upon the single most perfect girl in the World. Off the back off delightful & insightful conversations (albeit by text) I knew I had to meet her at any cost! I also knew that everybody loves Ice cream (Even Vegans!) and successfully tempted her to meet me at a local ice cream parlour. I would never be able to get enough of her. So we met again the next evening..and the next…and the next. And then after some time With the love & blessings of her remarkable mum (soon to be my 2nd mum- yay!) 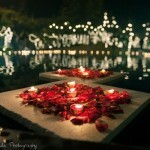 and beautiful family, I decided to ask Nitima the question I knew it was my destiny to ask. 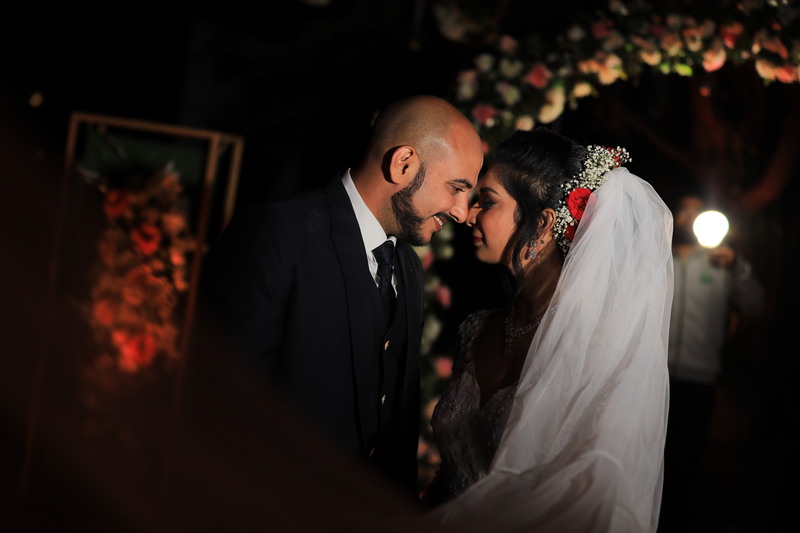 The honour of having Nitima as my wife & soul mate would be the greatest gift I could receive from the universe. I decided to do so as we traversed across the city’s skyline via helicopter; as a subtle ode to the city, we would call home together. I still thank my stars that she said yes, a parachute escape if replied in the contrary would be a tad difficult! Brides side of the story: There are a million reasons why I love Jahan, however the top one on the list is his immense love for his Mom. Both of us being single parented kids understand the importance of our Mum’s in our life. I happen to be a Sikhni from Jaipur who against her wishes moved to Mumbai for her internship with Procter and Gamble. I hated Mumbai when I moved here but then thanks to Tinder I met Jahan and I guess the only reason I ever decided to come to Mumbai was because it was fate for me to meet Jahan. Little did I know I would find the love of my life on a dating app when I already was running my own dating app and only got on tinder to research for my previous start up. Our first date went on for 4-5 hours over ice cream and took place on the auspicious day of Rakshabandhan. Jahan being a parsi obviously didn’t understand what Rakshabandhan really stands for and a lot of people actually thought that it was just two siblings who literally look way too different from each other were sitting together celebrating Rakshabandhan. It still is an active joke amongst our friends. 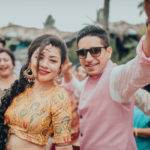 We have gone through all phases of a relationship I believe from dating to the romantic honeymoon phase of the relationship, to a long distance saga then finally in a live in relationship and now marriage. My career advanced from an intern at P&G to working with the member of parliament Poonam Mahajan and further hosting a UN conference for The Right Honourable, Prime Minister of Canada Justin Trudeau during his visit to India and through all the long work days Jahan Stood by me like a rock. Our marriage is a celebration of the eternal love we have for each other, as well as the love we share with our families. It’s a privilege to be able to share our first official steps of a lifetime together with our families that are so different and yet so similar. Barat Welcome The wedding started with welcoming of the grooms family at the resort done by the bride herself along with her family. 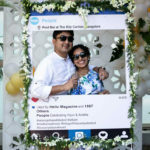 In the pictures you will witness cute moments where Jahan & Nitima are hugging and just gazing at the beautiful few days they are about to have and boy have we ever seen a bride dancing it away like Nitima does. Go take a look at the pictures and relive the fun, positivity and hopefulness of the moments captured. Mehendi Nitima’s Mehendi was nothing short of everything super adorable and cute, While one person is busy drying her Mehendi the other one is focusing on making her drink and eat. Meanwhile her mother is trying to cover her precious daughter in woollens so she doesnt get a cold. 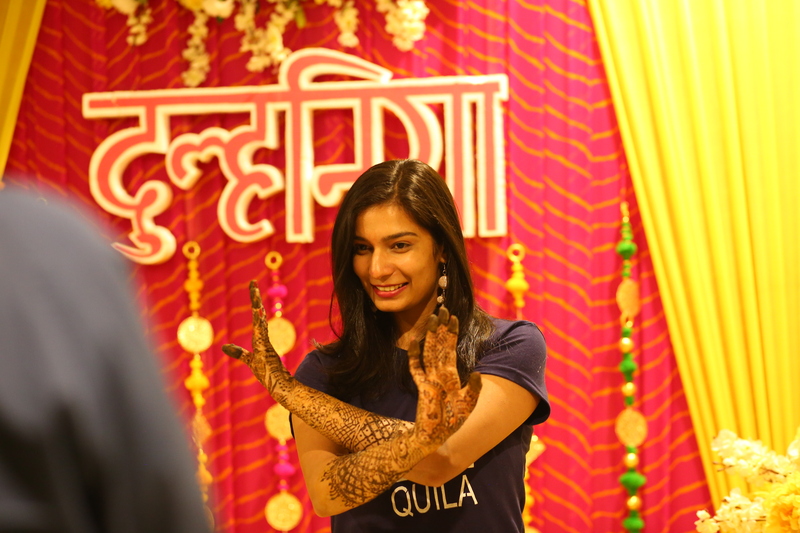 The decor on top of that along with Nitima’s beautiful “Phtaka Dulhan” footwear added the fun to a beautiful and surreal Mehendi. Bachelors + Hens Jahan & Nitima decided to have a combined Bachelors + Hens and made it a point to include both their families. 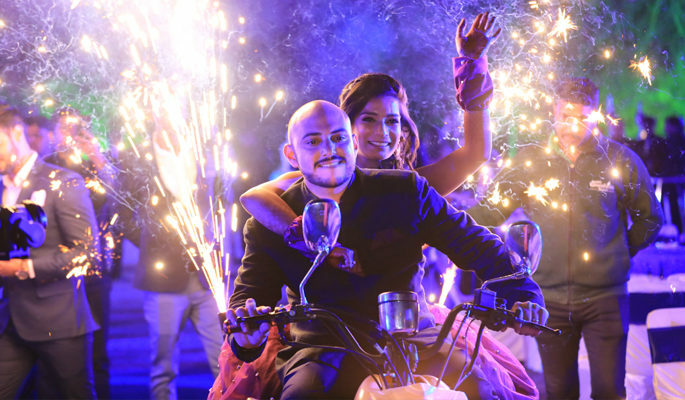 Jahan along with his wolf pack and Nitima along with her Bride Tribe set the dance floor on fire. 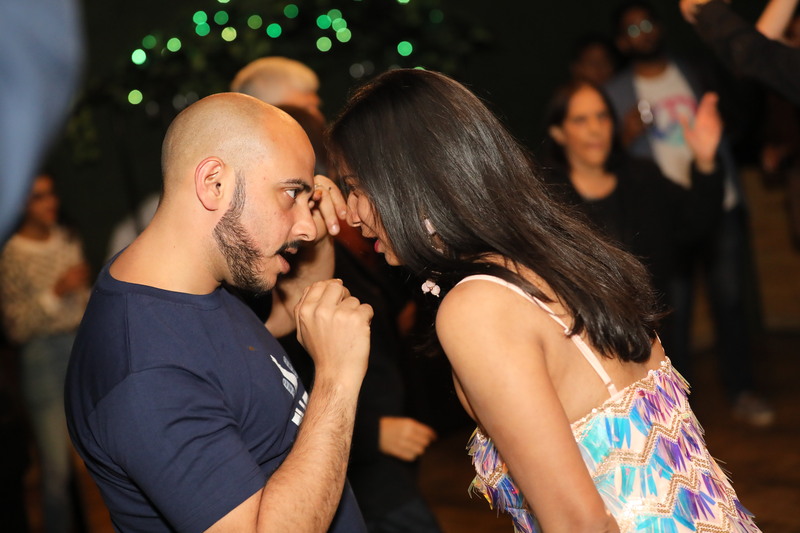 Go witness some super cute images of these two on the dance floor and the funny drunk fall moments. 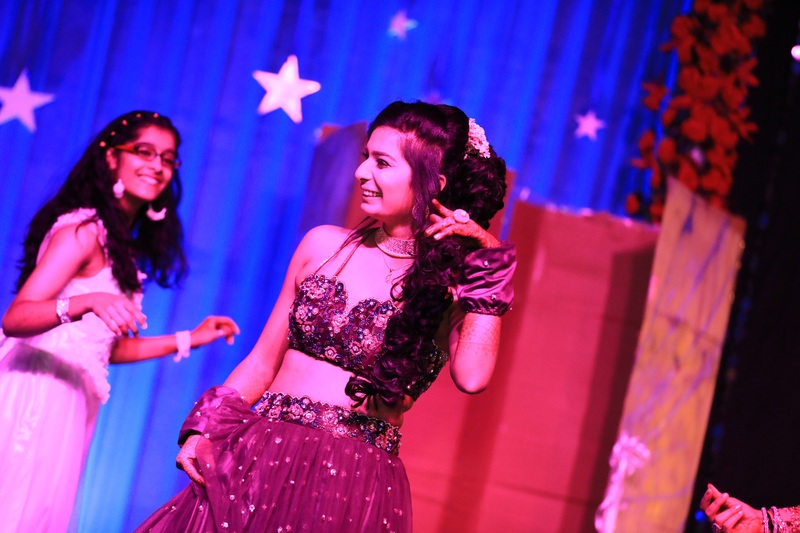 Haldi + Holi and Foam Dance Party We might be a little biased but Haldi was undoubtedly the most fun function at this beautiful wedding. Nitima dressed in a Yellow drape Saree and topped it with floral jewelry. They both entered together on the song Ban Ja Tu Meri Rani and then the madness unfolded. The event started with an aarti of the bride and groom and then the guests applied Haldi and Ubtan Mix on the bride and groom. Once the Haldi application was done the bride and groom decided to start the festival of Holi and moved into a foam dance party post that. We could see the guests having such a wonderful time. Since most of the groom’s family is from Australia most of them had never played Holi which made it all the more fun. 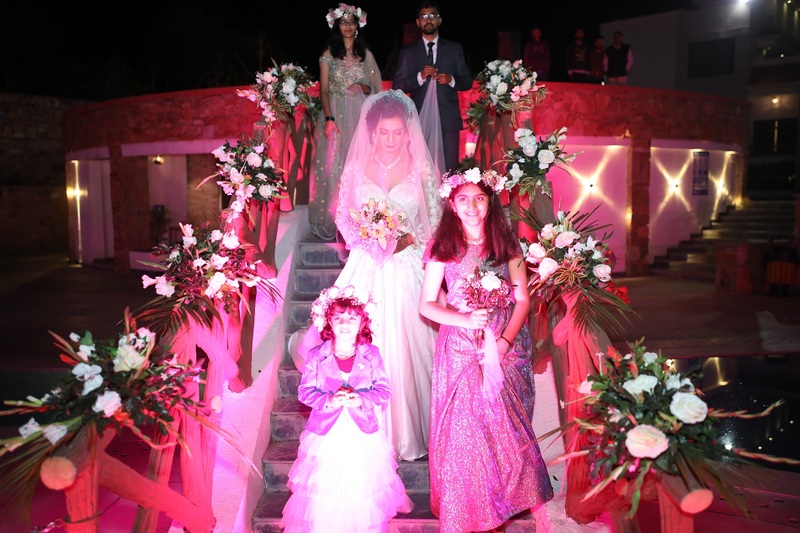 Go through the pictures to identify the bride and groom under layers of different colors. 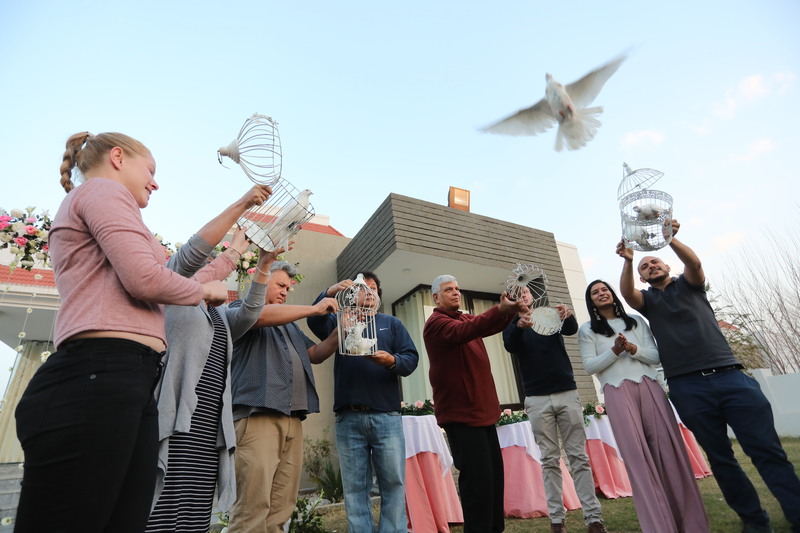 Dholki + Choora + Rajasthani Kite Festival Nitima’s choora ceremony was a whirlwind of emotions. It all started with the groom entering on Camel Cart along with Nitima’s younger cousins and his entire family and friends dancing on dhol. Soon after Jahan, Nitima entered on a royal palanquin (Palki) while the song Mai Nachdi Phira played in the background. As the colors and flowers burst up in the air everyone’s smile grew bigger. That’s not it, Jahan being an Australian isnt very good at Hindi even though he has stayed most of his life in Mumbai so Nitima’s mum gave a challenge to our groom to sing a Hindi song if he wanted his bride to wear the choora, so Jahan ended up surprising Nitima by singing her favourite Hindi Song “Yuhin Koi Mil Gaya tha”. As they both sang along together we could see the guests get teary eyed. 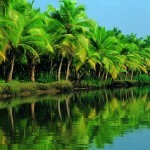 Post which was the fun element of Kaleera dropping on all brothers and sister. Once choora ceremony was concluded Nitima and Jahan started the kite festival and opened the floor for games of giant Jenga, and Balloon Shooting. 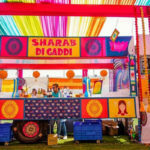 The Lunch was also around the Rajasthani theme so the decor was breezy and colorful with Rajasthani seating for serving Lunch. 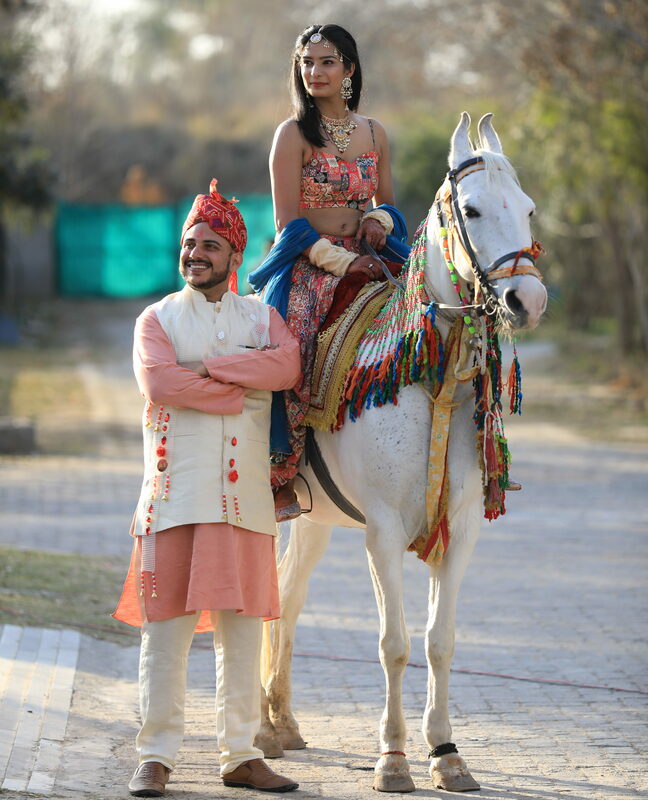 Don’t miss the pictures of our bride riding the horse. Since it was the cocktail night we certainly don’t have much memory of the entire event other than the fact that all the guests danced their hearts out. 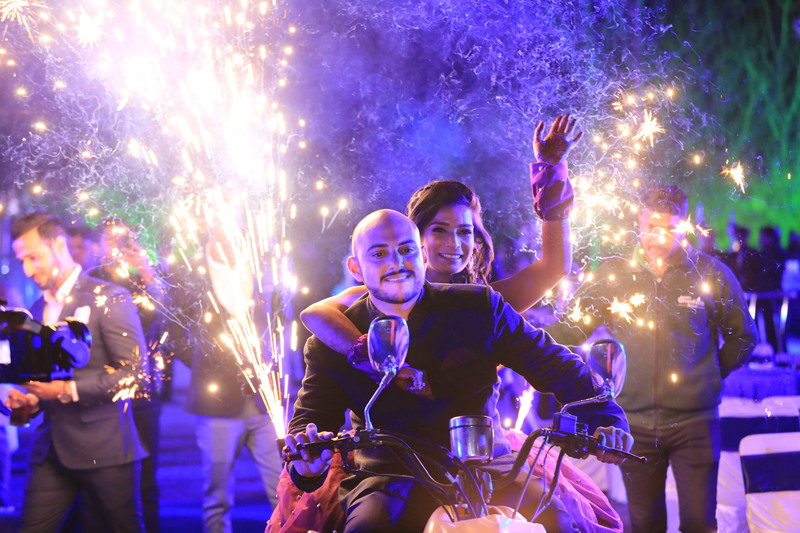 The function was one hell of an adventure with the immediate families coming on stage wearing capes and roasting the bride and groom followed by the entry of the bride and groom on an ATV Bike. 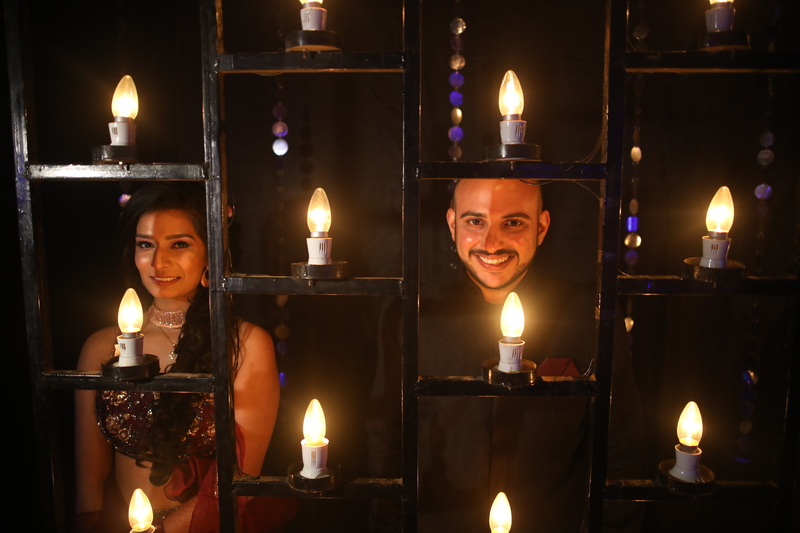 The real magic unfolded when the famous illusionist Shikhar Kamat won hearts and shocked our Bride with his incredible Magic tricks. The ending of this night is something which we dont think can ever be topped, Jahan uncle who runs his band dilip n the davs did a live band performance for the bride and groom and made everyone take out their phones, turn up their flashlights and wave the night away. 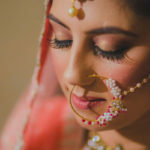 Nitima’s family is Sikh and so they wanted a beautiful gurudwara ceremony to be conducted. 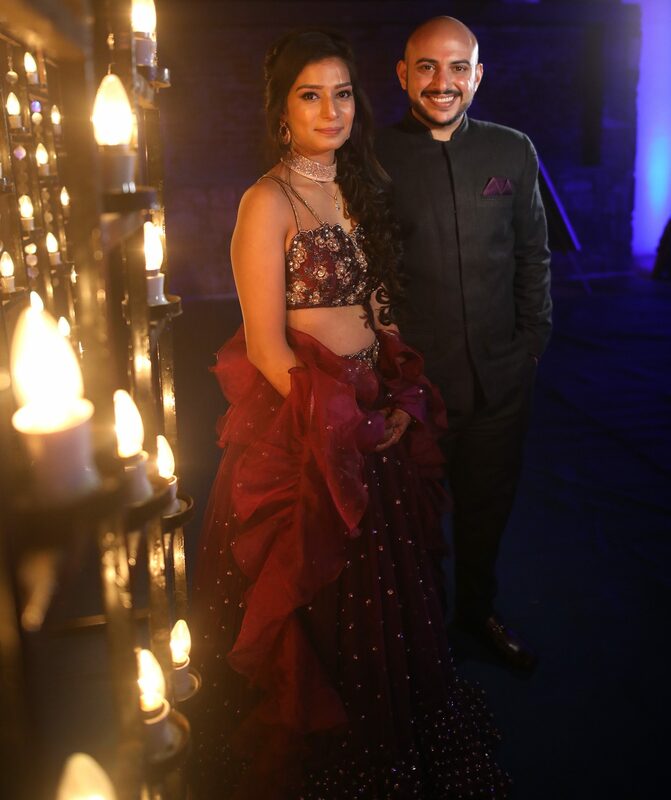 Nitima chose a baby pink color palette for her lehenga along with Red and Green stones Kundan Jewelry. She wanted her look to be minimal, bubbly, bright and royal at the same time expressing the youthfulness of a young girl yet the grace and poise of a mature woman. Meanwhile Jahan wanted a subtle and decent look for himself. 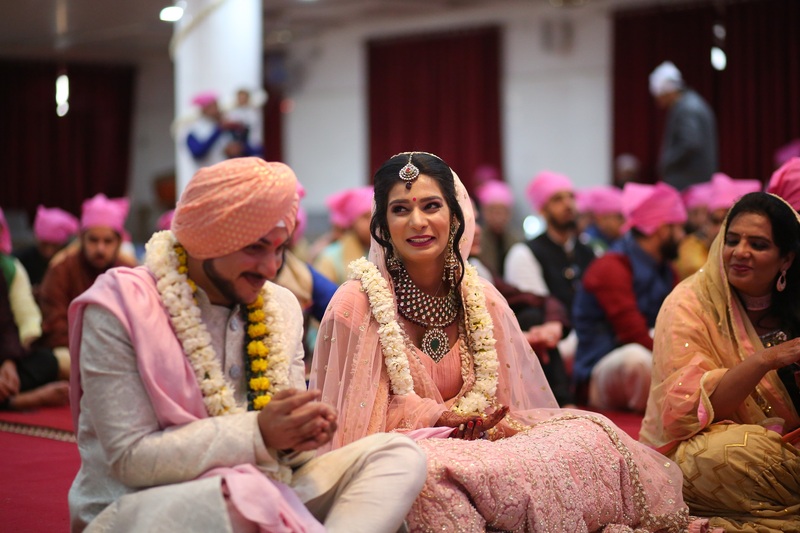 He chose a light grey sherwani and complemented and coordinated with Nitima’s color palette through his turban and Jewelry. 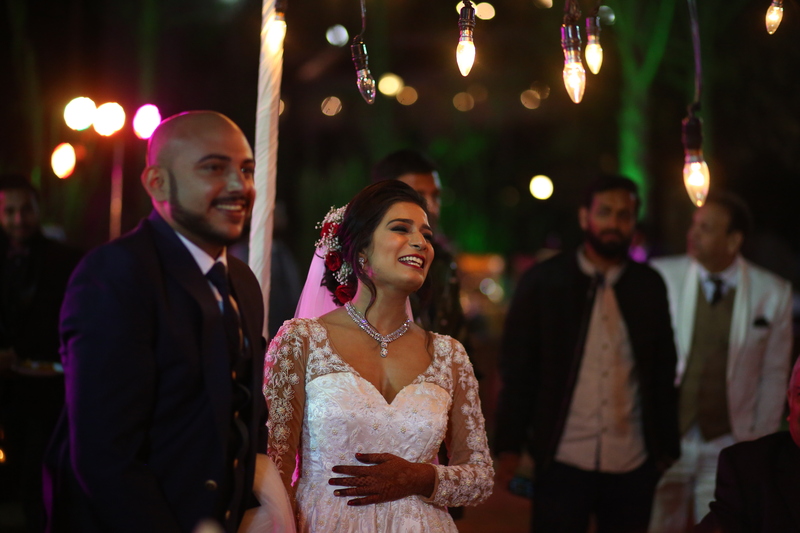 All guests wore Pink color dastars on their heads to complement the bride and groom’s look.Nitima entered under a floral umbrella with her best brothers and Jahan entered with a floral safa along with his best men. The ceremony was full of cute moments and the pictures capture the bride and groom smiling at each other quite often. 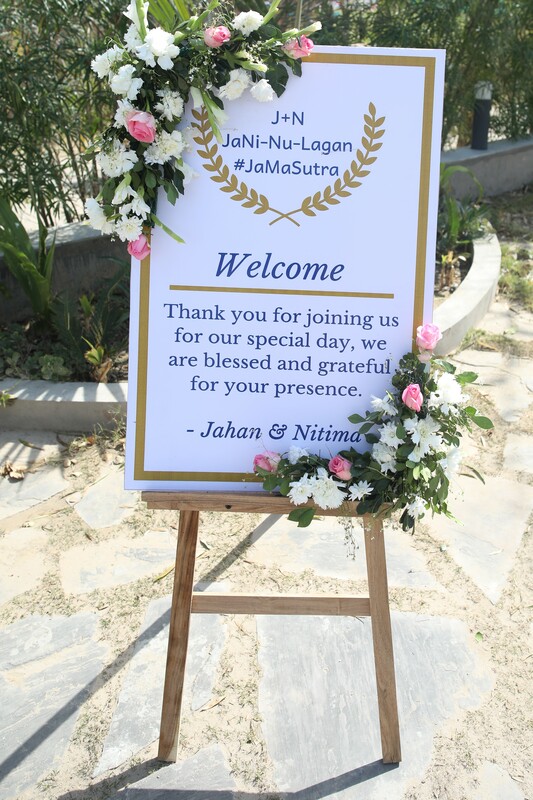 Jahan’s family is Parsi and so they conducted a Parsi ceremony as well which was followed by Toasts by the immediate family and bride and grooms closest friends. 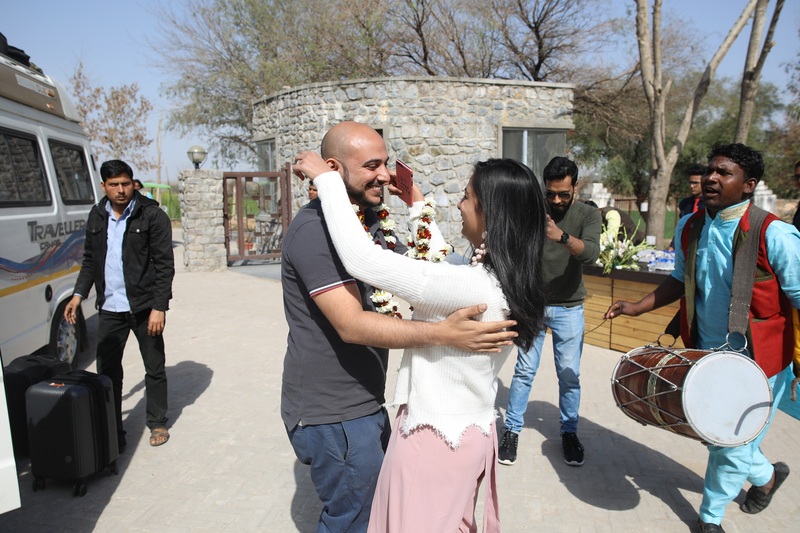 Nitima and Jahan entered along with their families, groomsmen, grooms maids ,bridesmaids & bridesmen on the track You & Me by Meute which has been their go to favorite song. The ceremony unfolded in by the auspicious achu michu ritual and ended with a kiss that sealed the deal.This was followed by cake cutting and toasts given from both ends which brought tears, smiles and a multiple other aww moments.